The comments and opinions contained in this guide to controlling Firmiana simplex are suggestions only, based solely on the experience of the author, and in no way are the treatment results guaranteed. The intentional use of CPT is typically in an urban environment — courtyard, backyard or commercial plantings as a fast-growing focal point. Unfortunately it’s a very short leap to the incredibily dense forest takeover that can quickly suffocate virtually every other understory plant in the woods. Take control. 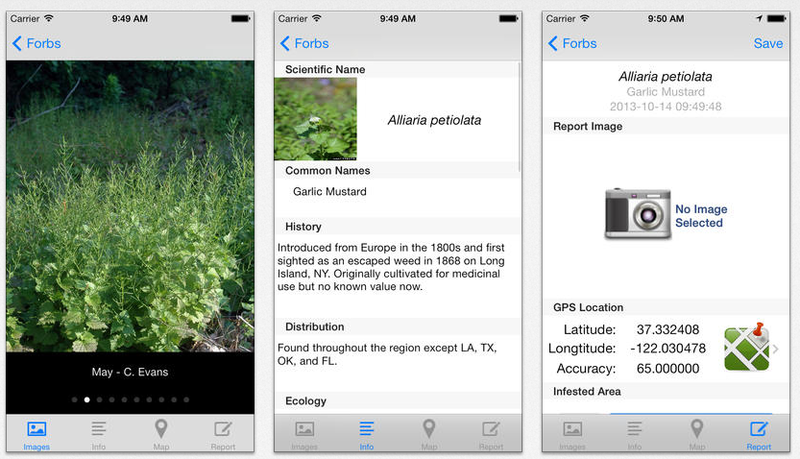 Smart phone users can download this Invasive Plant Control app developed by the University of Georgia to track and report on invasive species. 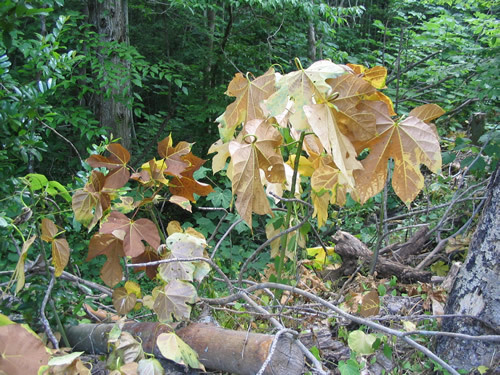 The Invasive Plant Guide on the control and destruction of invasives was developed by the Hillsborough County (Florida) Parks, Recreation and Conservation Invasive Species Task Force in response to the critical challenge posed by introduced plant exotics. It describes how to recognize invaders and details the proper use of the most effective herbicides for control. Download LSU Ag Center Forester Brian Chandler’s excellent field study on the efficacy of eight industrial herbicides in killing Chinese parasol. Very helpful for identifying the tree in various stages. Visit TexasInvasives.org for information on CPT and a variety of other plant, insect, and animal threats. The occasional use of this tree isn’t the problem, but rather the source of the problem. Once CPT escapes using a very efficient system of seed distribution helicoptered into any surrounding woodlands, a well refined campaign of stealthy advancement begins. Left unchecked, the plant explodes into a full blown invasion that’s difficult to control on a small scale and nearly impervious to modification in larger areas. (ST. FRANCISVILLE, LA) The introduction of Firmiana simplex, aka CPT — Chinese parasol tree, or just parasol – in West Feliciana parish is thought to have occurred sometime in the early to mid-20th century. 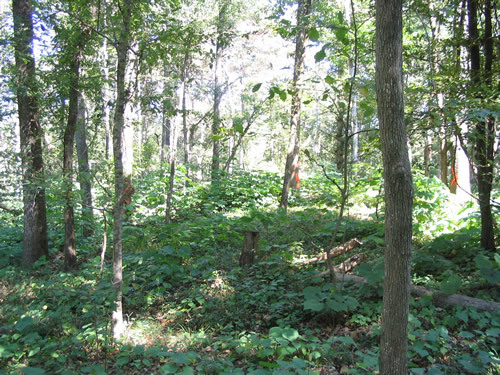 The original source of the non-native hardwood infestation is believed to be on – or near – Rosedown Plantation. Little more than five decades later numerous locations throughout the parish have been completely conquered by the aggressive invader, suffocating hundreds of acres of native vegetation, wreaking total environmental havoc, and creating a control nightmare in the process. 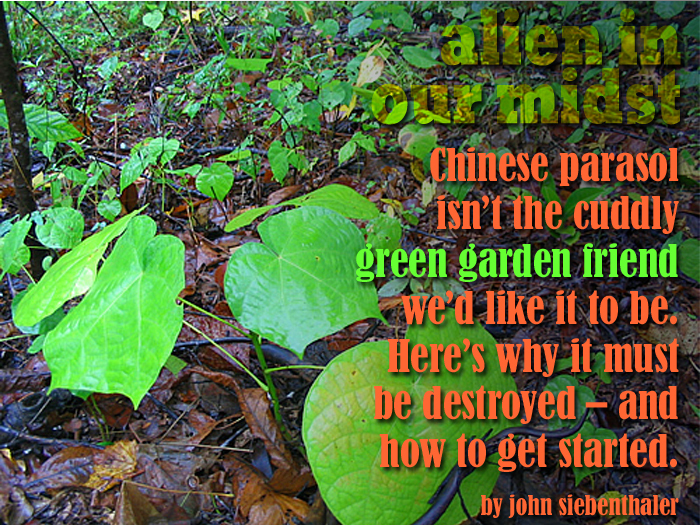 When – not if – the prolific breeder escapes into the wild there’s little to slow it down. The tree’s perfect camouflage lets it blend in undetected, rendering the damage invisible until the takeover is complete. Once able to recognize the distinctive crown, observers can easily detect the invader. In St. Francisville, the CPT-infested woods bordering Commerce Street around Sullivan Dental Center and Wyoming Plantation illustrate both the extent of the problem and the extreme difficulty of selectively correcting the situation. How tough are Chinese parasol? They survived the Hiroshima atomic bomb from a distance of 1.3 kilometers. Comparisons to kudzu are obvious. It’s probable that in a gardening shootout, the landscape strangling vine could emerge as the dominant invasive of the two, but CPTs ability to gain a formidable foothold in a variety of habitats remains impressive. Parasol quickly dominates any habitat it escapes to, and because as lumber it’s worthless — the wood is too light and soft – there’s no immediate reason for culling. CPT may have once been aggressively planted as a quick source of forest revenue to augment the region’s soft and hardwood forestry products. Its benchmarks – fast, straight, self-limbing growth – that are responsible for the nightmare’s supremacy in a native habitat still look at first glance ideal for lumber or, as some think, a failed pulpwood experiment. I use Sawyer’s Permethrin Clothing and Gear Insect Repellent for complete protection against all types of insects, especially ticks. I treat everything from socks to hats with good success against bites and stings. They’re everywhere – you just can’t see them. A CPT takeover is powered by sheer numerical advantage that kills off most other plant forms by denying them the air, water, sunlight and nutrients necessary for survival. Whether as seedlings, saplings or mature trees, they’ve evolved to successfully block light from reaching the forest floor regardless of growth stage, thereby preventing all but a few hardy indigenous species from surviving. From Savannah, Georgia west to Austin, Texas and Santa Barbara, California, this pest is recognized nationwide as a major biological threat in varying stages of prohibition and is listed by the U.S. Department of Agriculture as such on the invasive species web site. Unfortunately, Louisiana to date has yet to fully address the horrendous environmental and economic impact of this uncontrolled invader. It continues to be a recommended landscape species by the LSU Ag Center in its downloadable (pub1622treesLOWRES.pdf) publication Trees for Louisiana Landscapes, as well as numerous other publications, even as the state provides grants specifically for the removal of CPT. Other notes: native of China, naturalized across the southern United States from N. Carolina west to California, grown as far north as Washington, D.C. and readily available online and from nurseries. That’s the background. For any successful reclaimation to succeed, mature seed producers need to be totally eliminated, and at nearly twice the commonly stated height of 40 feet and up to two feet in diameter, this can be a daunting, dangerous, expensive, and labor intensive task. Drought tolerant and cold hardy, this messy deciduous intruder quickly spreads, becoming so dense in just a few seasons that what from only a few feet away looks like a healthy forest is in fact a single species monosystem, rivaling other despised and horrendously destructive pests like Chinese tallow, Brazilian pepper, and Melaleuca. The well-adapted pest flowers in spring and early summer. 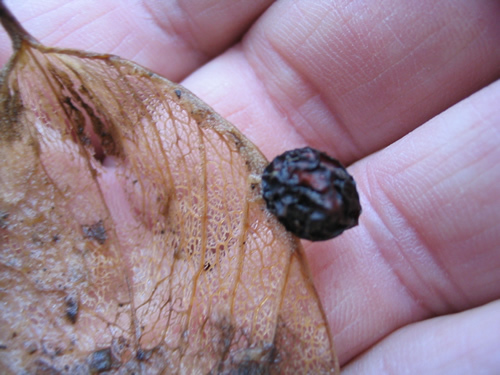 Each bloom forms five fruits that end up splitting open like a leaf after first oozing a brown, tea-like liquid. The leaflike appendage bears multiple seeds that after launching their airborne assault flutter daintily earthward towards a soft landing in our fertile West Feliciana habitat. Hallmarks of the tree, with it’s signature parasol crown, include incredibly fast growing nurseries that quickly form a relentless suffocating canopy just a few inches off the ground. Notice the newly sprouted colony in the photograph at the top of the page. After the seed bearing parent trees were cut down these first-year seedlings germinated as soon as the sun hit them. Left untreated, they grow at a phenomenal rate and upon reaching maturity perpetuate the cycle. The seeds — unusual in that they’re arrayed around the perimeter of the ersatz leaf (above left) — are well designed for widespread aerial dispersal from heights of 50, 60, 70 feet and higher. They drift down or are scattered by the wind in overwhelming numbers that easily germinate in massive quantities, rapidly suppressing through sheer numbers even the hardiest plants. For a look at the tree’s growth and appearance characteristics, visit the LSU AgCenter/School of Renewable Natural Resources web site. Parasols escape detection by masquerading as a healthy forest (top). 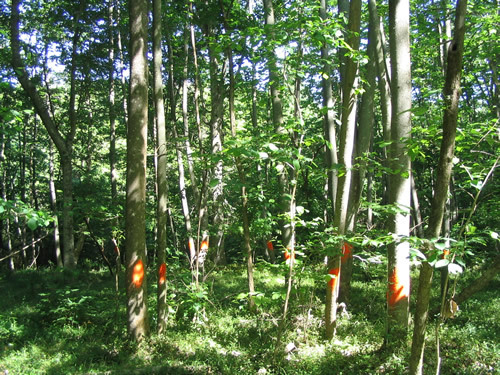 CPTs were highlighted with surveyor’s paint, demonstrating how effectively they are in taking over wooded areas (bottom). Our introduction to CPT began in 1999 on eight wooded acres off LA-10 just east of St. Francisville. Formerly part of historic Rosedown Plantation, we’d explored the property several times before buying and, being unfamiliar with CPT, assumed it was part of a healthy hardwood forest ecosystem. Throughout the property there were ones and twos of other native varieties: sweetberry, a scattering of various oaks (Shumard, water, laurel, cow), ironwood, and two veteran magnolias. Old growth beech and plenty of sweet gum are the only species existing in any numbers, while patches of silver bell and dogwood have managed to hang on in the few areas of heavily shaded woods to escape encroachment. But the overwhelming dominant tree throughout was Firmiana simplex, by the many hundreds of mature trees, thousands of understory saplings, and tens of thousands of seedlings on our acreage alone. As Floridians new to the Felicianas, we’d even been told by the realtor there was side money to be made were we to set up a roadside stand and sell them to passersby. To our dismay we soon discovered that nurseries throughout the region, both wholesale and retail, sold and continue to sell to this day CPTs as being ideally suited for residential landscaping. The prolific and efficient production and distribution of Firmiana seed requires that seed sources be interrupted as the first step in bringing the pest under control. Pay close attention when felling — these unpredictable toothpicks fall anywhere, anytime, without warning. Little is known in this country of the overall characteristics of the plant. Germination rates, viability, life span – there’s just not much literature available for guidance. The only qualified field study on control was done here in West Feliciana by Louisiana State University’s AgCenter Area (Clinton office) Extension Forester Brian Chandler. Download his excellent 2001 controlled trial that evaluated the hack and squirt seasonal application of eight industrial strength herbicides. Seed distribution in a heavily infested area. Removing the canopy allows thousands of fallen seeds to quickly germinate, while seedlings and saplings react vigorously to their sunny new environment. Seedlings are easily controlled using either spray or mechanical (mowing) methods. This method is very efficient, especially for treating larger trees, but there is one drawback to hack and squirt: the trees quickly die in place, but don’t decay as rapidly as when felled to the ground. Depending on your situation — and the size and height of your trees — the unpredictability of having a forest of 30 to 70-foot tall dead trees overhead, potentially numbering in the hundreds and ready to topple or collapse without warning, may not be a desireable condition. And although the mature trees are dealt a death blow, their progeny will have to be sprayed several times. Doing so among a forest of ready to topple trees may present a problem, as could fire, with so much potential fuel stored vertically like a parade of matchsticks ready to ignite. Compared to the alternative (chain saw) though, hack and squirt is definitely much safer to administer initially, easier and faster to apply, less destructive of any adjacent beneficial vegetation, and 100% effective in killing the tree and any subsequent suckers. Most importantly, it is also effective in delivering the critical first step: immediate and thorough elimination of the seed source. For more details, call the Clinton office. Thanks to their large leaf area and rapid translocation, CPT is very susceptible to a targeted herbicide. My preferred procedure is to first cut down mature seed bearing trees and then spray the seedlings and smaller saplings with a 1.5% (2 oz/gal) Brushmaster® solution combined with a few drops of dish soap added as a surfactant and several ounces (per 4 gallons) of ordinary rubbing alchohol (isoproponal) as a penetrant. Even at this low concentration, a drenching spray that girdles parasol green bark is very effective in killing the tree. Brushmaster® is an economical combination spray featuring dicamba, a pre-emerge herbicide that acts as a disruptive growth hormone, and 2,4-D. Although deadly for the parasol it’s use is forgiving of non-weedy grasses that are essential to erosion control. (Because it is a pre-emerge herbicide, take caution to avoid the roots of desireable trees and ornamentals.) You can review the Brushmaster® label here. UPDATE August, 2017: One of Brushmaster's primary ingredients is dicamba, which is also the main component in XtendiMax herbicide, sold by Monsanto for use on its proprietary Xtendiflex soybean hybrid seed. Arkansas and Missouri have temporarily banned the use of dicamba because of extensive damage to other crops due to drift which is said to have occured after use of off-brand herbicides containing dicamba and 2,4-D. If you choose to use Brushmaster, please read the label carefully and follow all instructions for application. Fortunately, the wide leaves of the parasol are hard to miss and offer plenty of surface area to absorb treatment, retaining most of the applied spray. The relatively low dilution rate, which breaks down quickly after application, also minimizes the threat to desireables. Please follow all safety precautions when applying this or any other chemical control. Delivery is straightforward: a medium to coarse mist from a backpack sprayer is applied as a foliar to the point of runoff. 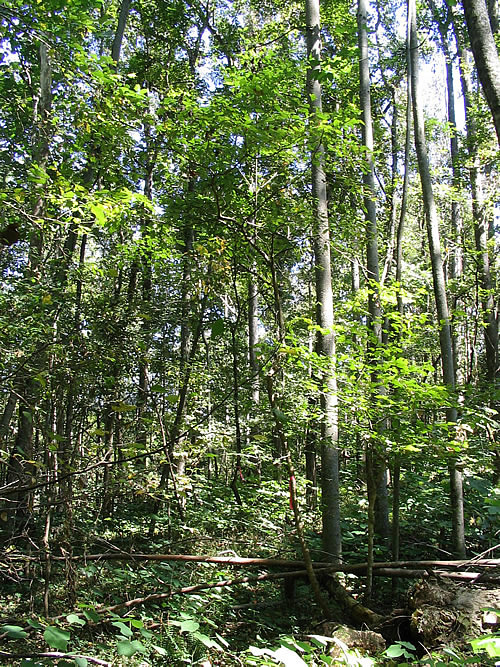 Spraying the trunks of green bark saplings is especially handy in the ravines and prompts collapse without a trace within a season or two of treatment. I also spray freshly cut stumps with the same solution, and when liberally applied there is virtually no residual suckering. Although Brushmaster’s recommended only for April through August application, I’ve had excellent success regardless of the month. In winter my primary method has been as a green bark or cut stump application. A back pack sprayer allows precise application to control seedlings and is especially useful on steep slopes where mechanical control isn’t practical. A coarse spray is easily controlled. A few days after spraying, impact on second year seedling (above) is obvious. My DR walk behind brush mower easily navigates the rough terrain and slopes while whacking parasols up to three inches in diameter. 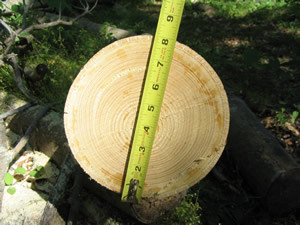 A stump diameter of 8"-12" inches is common. One tree measured 70-feet in height. There are any number of potentially effective herbicide combinations that could be equally efficient, including Grazon®, another combination herbicide containing 2,4-D and the systemic picloram. Often used by utilities for controlling brush along transmission lines, the issue of a systemic could be problematic. Both the choices listed above are selective. Non-selective glyphosate (RoundUp®) is familiar, commonly available, inexpensive in it’s generic form, and popular. But because it’s a broad spectrum herbicide that kills indiscriminately I’m hesitant to use it, particularly in the ravines where any loss of erosion control has negative consequences. For an easy to understand overview on managing agricultural chemicals, visit Ohio State University’s web page on herbicidal properties and uses. Control begins with a methodical chain saw attack on mature seed sources. 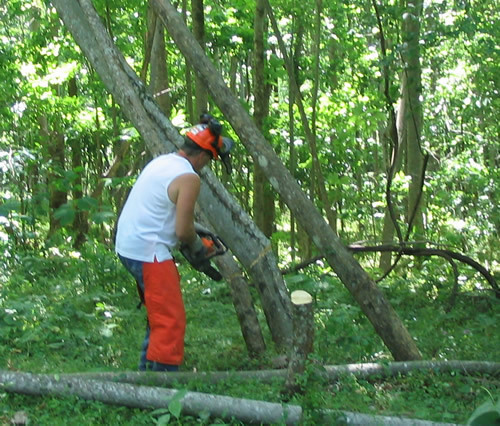 When possible I limb and section the trees after felling as an aid to decomposition. The more cuts that can be introduced, including a new strategy of slitting the bark lengthwise to allow penetration, the quicker moisture and insects can begin the process of composting. Light mowing and string trimming are effective for plants in the nursery stage. Parasol bark, though, is extremely tough. I first tried a DR 5-hp walk behind string (.175mm) mower but even that can’t cope with stems larger than 5/16" or so without stripping out the cord. Adding a 15-hp DR Field Mower solved the mowing challenge. 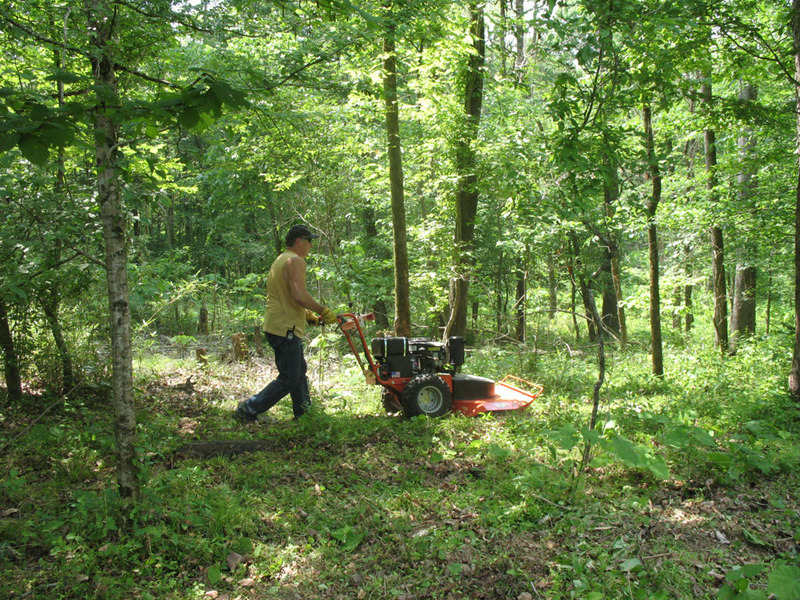 When the optional Brush Blade is added, the mower can cut down saplings up to two inches in diameter. Suckering from cut stems is a problem and successful control may take more than one pass. Seedlings that were sheltered from the sprayer by the overhead canopy will survive, but their numbers diminish significantly once seed sources are eliminated. Retreatments — spraying, mowing or both — will be required over several seasons until the residual seeds are no longer viable, all seed sources have been destroyed, and all seedlings are dead. 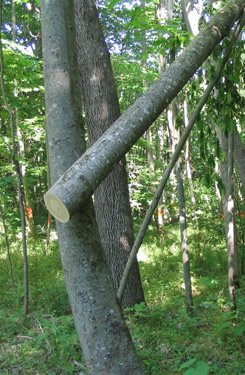 While mature trees (gray bark) require aggresive measures to bring under control, the green bark stage is easily subdued by sawing, cutting, or spraying. 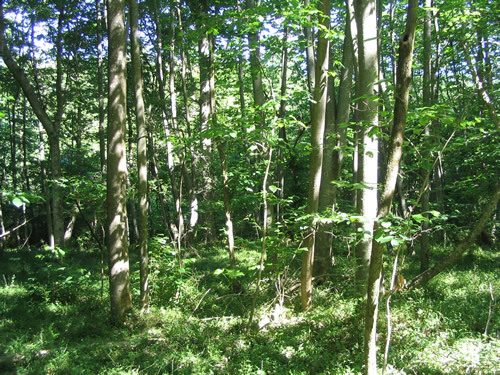 Saplings are generally one to three inches in diameter. They’re easy to snip using compound lopping shears. 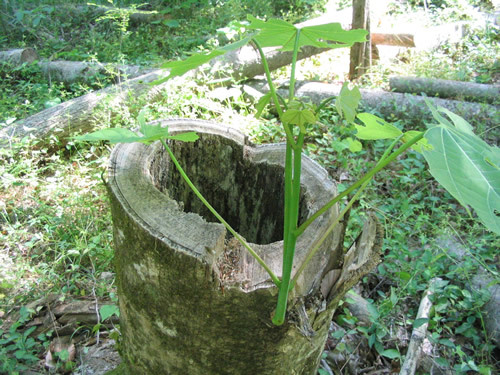 Cutting alone, regardless of tree size, needs prompt stump spraying because of the sucker growth that always occurs. Chinese parasol has that single characteristic common to most invasives: cheap to buy and very rapid growth, which all too often is the most favorable trait cited by homeowners when purchasing plants for casual use. Straight and self-limbing, they’re favorites for ornamental use in courtyards and small space gardening, and have been widely promoted for urban situations. They remain a recommended species in the LSU School of Landscape Architecture and are sold in nurseries and garden centers throughout Baton Rouge and Louisiana. Tree at time of cutting (top) and six months later. There was no outward sign that the trunk was hollow – and extremely dangerous. Suckering will occur if the stump’s not sprayed. Regrowth won’t grow to maturity but will compete for light, water, air and nutrients. CPT offers no useful habitat for wildlife in terms of nesting, browsing, or other beneficial attributes, and a best guess parasol lifespan in the Felicianas might not be more than 40 or 50 years in the most heavily infested areas. There is a thought that CPT helps retard soil erosion. In fact it’s a very unstable tree with a propensity for rot and a relatively shallow root system. It’s easy to find trees that have toppled over when not supported by a dense tangle of neighboring parasols to lean on, due to rot or insufficient root support. In fact, the native vegetation it eliminates is much better suited for erosion control. 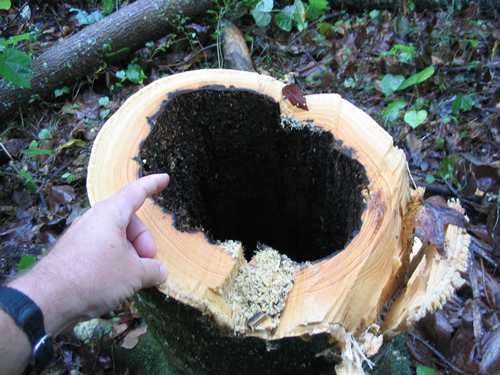 Interior damage to an outwardly healthy tree is difficult to detect, and the results can be sudden and dangerous. The core of the tree in the photos at right was completely hollow, the result of an old wound and opportunistic carpenter ants. Externally, there were no visual indications of any weaknesses in this 40-foot tall intruder growing beside a favorite path. Why hadn’t it fallen? Because the trademark arrow-straight growth habit and lack of branching makes for an easy balancing act, one that’s quick to fail when high winds and/or unstable (rain saturated) soil become factors. Even when a tree’s been properly notched during cutting and there aren’t any obstructions to hang up on, they don’t always fall as predicted. It’s up to us to help. Begin by learning how to identify the invader, so you can point it out to your friends and community. If you see it used in a commercial setting, let the shop owners know about the threat. Document occurances and use your own social media to spread the word. Parasols are a serious problem that’s silently getting worse, but a public that’s aware can help slow it down. Over the course of our multi-year campaign to renew the habitat, I’ve cut down hundreds of trees and we’ve sprayed, lopped and mowed tens of thousands of saplings and seedlings. Those efforts are paying off, as diversity responds to fill the void left by the departed parasols. We’re honored to be part of the Louisiana Natural Areas Registry Program to preserve and protect Louisiana’s natural environment. You can help spread the word by joining the conversation on the Chinese parasol Facebook page. You can also contribute by registering your CPT sightings on the University of Georgia’s EDDMapPs (Early Detection and Distribution Mapping System) web site, part of The Nature Conservancy’s educational effort. Step 4 will take several seasons or until all viable seed and sources are destroyed. There’s no information on how long seeds remain viable. Controlliing the seedlings once the seed source is removed is relatively easy when the terrain cooperates. Caution! Parasols Can Be Extremely Dangerous! Rotten cores and frequent snags combine to create widow makers in heavily infested areas. When using a chain saw have an escape route, be aware of your footing and keep your equipment in peak operating condition - including a sharp chain. This steep hillside is densely carpeted with CPT seedlings – clear evidence of seed bearing adults in the vicinity. These pop-up nurseries are easily controlled with minimal spraying. Wood usually rots within several years of cutting. Stumps take longer, but in general debris is composted in a relatively short time. 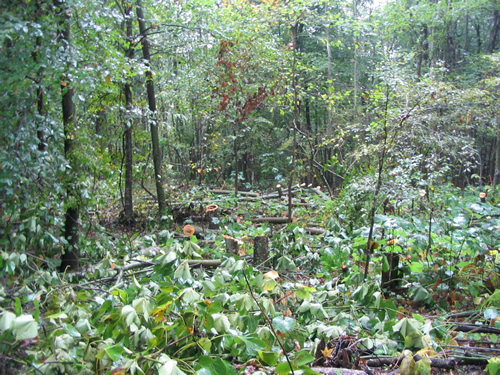 Freshly cut area (above) was nearly impassable prior to clearing. 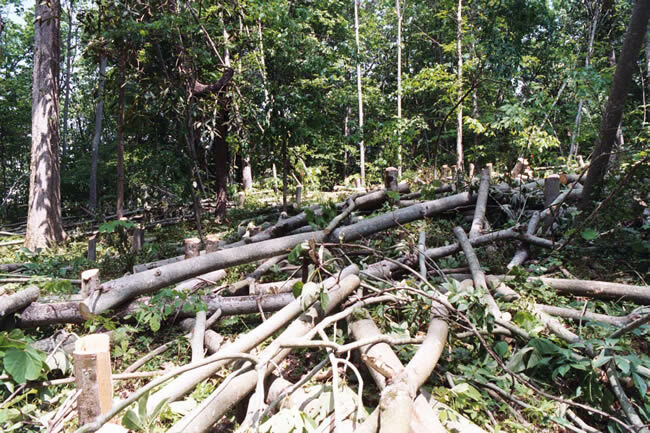 Trunks (below) were limbed and bucked to speed decomposition. A line of vulnerable new seedlings, quick to sprout in disturbed soil, has been freshly sprayed. Leaf yellowing indicates cellular disruption of the plant’s chlorophyll. Snags are common. A result of dense colonization that’s characteristic of parasols the crowns easily interlace, preventing the trunk from falling. A clump of several intertwined trees that hung when cut. Decay and wind will bring this group down. Always remain alert to the threat of widowmakers. A tangle of fallen trees crisscrosses this thicket of CPT. Very crowded conditions mean extreme care must be taken when cutting. Most references cite mature heights of 30-40 feet, but they easily grow much taller — 70 feet plus is not uncommon in our area. 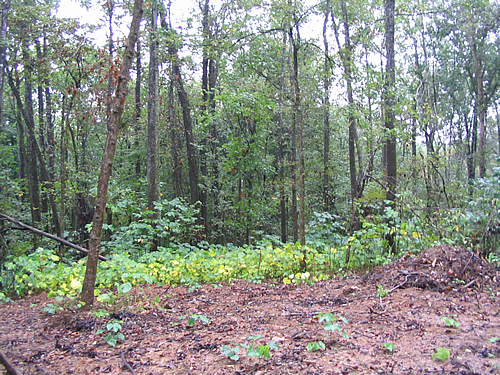 This hillside patch, cut in February, 2004 and left undisturbed, was 60-70 percent decayed by September, 2005. 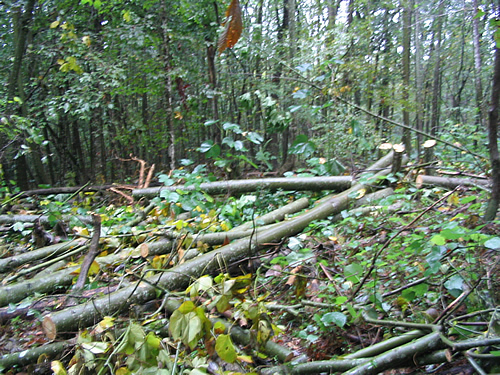 The remainder, primarily stumps and large trunks, took a few more years to decompose. 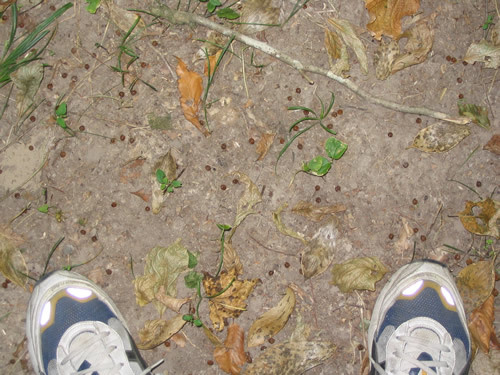 The USDA has a web page of apps for monitoring pests and invasives. 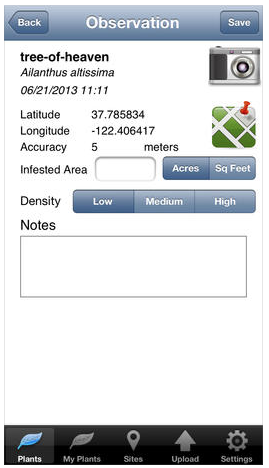 Smart phone users can download this Invasive Plant Control app developed by the University of Georgia's Warnell School of Forestry and Natural Resources to track and report on invasive species. The National Invasive Species Information Library contains extensive links on exotics. View Louisiana’s page for current news. This web page lists Firmiana simplex’s geographic distribution and categorization. Fine Gardening magazine explains the difference between aggressive and invasive, and includes a short list of invasives that have spread out of control throughout the country. A comprehensive (PDF) guide to the chemical treatment of invasives was developed by the Hillsborough County (Florida) Parks, Recreation and Conservation Departments Invasive Species Task Force. While CPT isn’t on the list, it details several pests that do threaten Louisiana, including Chinese tallow and cogongrass. The guide spells out safe and effective strategies for control and eradication efforts. Download Brian Chandler’s excellent PDF guide to controlling CPT using the hack and squirt method for herbicide application. Mr. Chandler’s study is the only known formal research to date on CPT eradication. You’ll find complete information on herbicides tested, the best time for application, and the rates used to achieve control. Hello Invasive Species. Goodbye Texas. This invasives website is a great resource for identifying a variety of regional threats, including the dangerous trifoliate orange. The Louisiana Department of Wildlife and Fisheries (LDWF) resource guide of various abatement programs available to property owners. The Nature Conservancy’s massive resource of identified pests, Global Invasive Species Initiative (GIST), includes the regional distribution and recommends treatment and controls. Best practices for a wide variety of invasives; valuable reference for plant, animal and insect invaders. The University of Florida’s Institute of Food and Agricultural Science (IFAS) 4-page PDF is adapted from the U.S. Forest Service 1993 handout (outdated) and summarizes CPT growth and appearance characteristics as well as distribution. The tree has been listed in a number of states as invasive, with moderate to extreme levels of impact. A joint effort between the National Park Service, the University of Georgia, the Ladybird Johnson Wildflower Center and others. CPT page contains great close-up detail of bark, leaves, seeds for easy identification in the field. Restored steam-powered sawmill in Long Leaf, Louisiana, recalls importance of pine forests to economy.